Many people eat bacon but few regularly peruse the news for news about hogs. Until now. Everyone’s talking about the Hog Apocalypse, a name that the media has given to what is happening to hogs in the state of Texas—which, if I were describing that thing in my own words, would be described as “people in Texas are giving pesticide to hogs to kill those hogs dead.” Hog Apocalypse: an item of concern? Yes, to hogs. But to our readers? Perhaps if you have a special attachment to hogs, then certainly. It’s natural to care for the welfare of friends. When the Hog Apocalypse comes up in conversation at your next party, drop this nugget: the pesticide they’re feeding to these hogs is called “warfarin” and it turns the insides of hogs blue. As the conversation begins, remark on the similarity of the words “warfarin” and “warfare,” which is basically what this is, to hogs; as the night grows later, circle back to the topic to remark on the spectacle of being served blue chitlins. “What are chitlins?” some idiot from New York City will ask. Give them a withering look. Later, take them out for a chitlin dinner and watch friendship bloom. If it doesn’t—you tried. The state of Louisiana also wants to poison wild hogs, but officials are concerned that other animals like bears will eat the poison too. It’s simply irresponsible to poison hogs before you have taken the precaution of killing all the bears of the bayou. 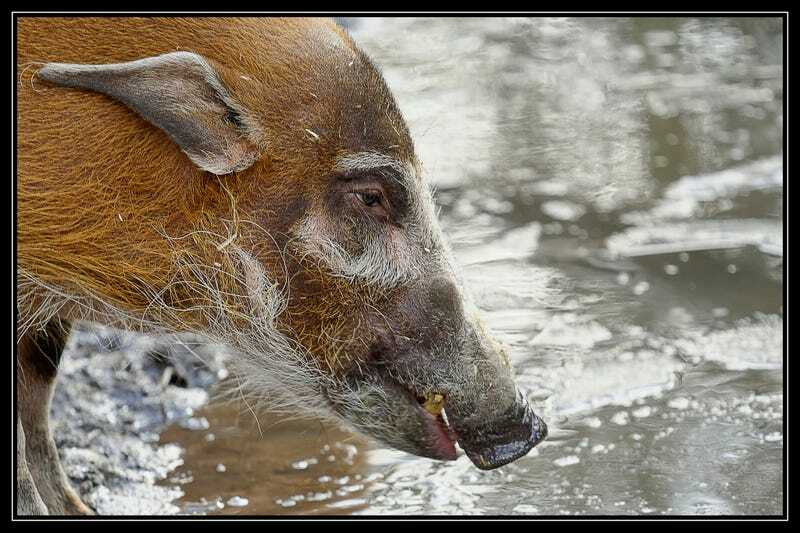 Know what disease wild hogs carry? “Pseudorabies.” Hey, call me when they’re carrying real rabies! I imagine my phone ringing insistently in the middle of the night. “Hello?” I say, half asleep. “The hogs are carrying real rabies now,” you inform me. This is the call I’ve been waiting for, and it’s time to carry out my plan—but not before getting a good night’s sleep. In southeastern Oklahoma hogs have been tearing up Ronda Talley’s back yard again. The United States Airforce is almost as important as our nation’s valuable archaeological sites. Only a fiend would disrespect one much less two of those valuable things. That fiend? Hogs. If you were to go outside, capture a hog, kill it, and offer its corpse for sale, two distinct things would happen: One, you would come upon the rude realization that lean hog futures took nearly a 4% price hit on just one day this week and that your “investment” of time has not “paid off” as handsomely as you had hoped when you were out wrestling the hog into submission; and two, disappointed in the low price of the open market, you would choose instead to keep the hog’s body as a sort of grotesque “mascot” of your venture, sitting it in a chair dressed up like a proper little boy. As days passed its stench would overwhelm your home and its unexpected rotting visage would shock your dwindling number of visitors. You just can’t give it up though. Something about that hog has made your heart tender. Can a dog love a hog? Yes. Can a hog love a frog? No. Can a frog love a log? Yes. You’ve wasted much of your life on the internet.